So you know how to ride a bike, but you never actually do? If you’ve got basic bike riding skills but not the confidence to use them, then Pushy Women training is for you! We’re thrilled to be able to present the second of our Pushy Women Training series for theCity of Yarra on Sunday May 8th! Pushy Women is a sociable and friendly training program designed to give you all the confidence you need, and quite possibly some new bike-riding mates! Each session focuses on local roads and bike paths so you can get familiar with the area where you want to ride. We’ll also be talking about what to do when you get a flat tyre, route planning around Richmond and beyond and there’ll be plenty of time to answer questions as they come up, whether they’re about bicycles, accessories, riding at night or finding friends to ride with. The Pushy Women Yarra training session is on Sunday May 8th at 10:00am in Richmond. You’ll receive details of the exact location in your information kit emailed to you the week before the ride. Suitable for women who have a bicycle and are able to ride a bike but wish to improve their confidence. All participants must be over 12 years old and any under 16 MUST be accompanied by a guardian who is also enrolled on the course. The course will be conducted in a traffic-free environment, then on bike paths and on roads. Don’t have your own bicycle? 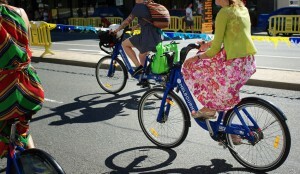 Did you know that the City of Yarra are part of Melbourne Bike Share? In fact, there is a Bike Share station at the end of Napier St, on Victoria Parade so if you don’t have your own bicycle why not borrow a blue bike?